Depending on the space available to you, domestic oil tanks can be positioned outdoors or indoors (including inside garages or outhouses). There are certain restrictions in both instances, to make sure your oil supply is stored safely and doesn’t pose an environmental threat in the event of a leak. Read on for some tips about inside and outside oil tank storage. Your tank must be positioned on a secure base. If not, the weight fluctuations between an empty tank and full tank can cause it to shift and settle unevenly, ultimately resulting in added strain to certain parts of the tank. Standing your tank on a concrete block or reinforced patio tiles will keep it sturdy and prolong its life. Make sure your tank is located downhill from your house and any outside water sources, to prevent contamination in the event of a leak. Keep your tank clear of fences, trees, long grass and foliage. Prolonged contact between damp leaves and the outside of your tank can cause premature corrosion. Install your tank away from any gutters or overhanging branches, where seasonal build-up of leaves or snow can fall and damage it. Indoor tanks must be stored at the lowest possible level of a building, and kept isolated in a one-hour fire-resistant chamber. Your tank must be fitted with a secondary containment system, such as an internal bund. Any floor drainage within the proximity must be closed, or adjusted in such a way that leaking oil does not pose a risk to nearby water (incoming or waste). Ensure your indoor tank can still be easily accessed and inspected from every side, and is at least 1.8m away from any openings (such as windows, doors or vents). 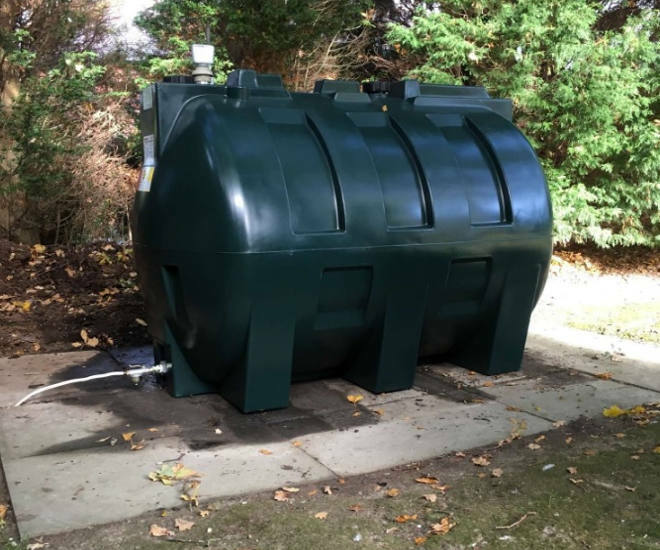 If you’re not sure whether to store your tank indoors or outdoors, our team of experts can carry out a survey and provide a professional recommendation. Contact us today for more information.